I couldn’t resist posting when I saw this one. As you may or may not know, Einstein wasn’t very big on quantum physics and largely bowed out of the entire discipline. His feeling was that it was too “theoretical” and prone to fanciful error. Ironically, it was his very own Theory Of Relativity that sparked the new scientific movement in the first place. Just goes to show you that no matter how smart you may be, you can still be wrong. Before he went off the rails however, he did some seminal work in quantum theory experimentation and discovered a truly unbelievable phenomenon. Einstein found that if you were to take a particle and split it into two parts, those two parts would still behave as though they were one, no matter how far the physical distance between them. He called this phenomenon (rather pejoratively) “Spooky At A Distance” behavior. I’ll give you an example. Say you want to send a robot to a far away planet and actually control it’s movements yourself in real time. At present, this is technologically impossible. The distance would be far enough that any radio waves you send to the robot would take too long to get there. It might take radio waves thirty minutes to travel the distance and thirty minutes to come back. By the time you were able to tell the robot to stop at the edge of a crater, it would have already fallen in. The same result would hold true for an optically based communications signal in the form of laser light, it has the same speed as radio although, radio can be made to go faster. You might also be able to do some fancy computational predictive analysis and control your robot better, but it still would have a latency that could prove fatal. Your robot might still fall into the crater. You could also employ artificial intelligence and give the robot it’s own brain but then, that would take all control away from you thereby defeating the purpose. So what do you do? “Quantum entanglement” to the rescue, AKA “Spooky At A Distance” behavior. You git yourself a particle, split it in two, keep one half for yourself on earth and put the other half in your robot that will travel far, far away. Now, when you rotate your half of the particle here on earth, the other half of the particle in your robot far, far away will rotate too, INSTANTANEOUSLY. Did you understand what I just told you? Let me say it once again. INSTANTLY, JUST AS IF THE PARTICLE WERE STILL IN ONE PIECE. The very same exact moment that you rotate your half of the particle down here on earth, the other half far, far away will rotate too, even though the two halves are millions or billions of miles away from each other. Crazy, huh? This is why Einstein called it “Spooky At A Distance”. He actually didn’t believe his own observations, really. He refused to believe his own “empirical” results. Einstein’s disbelief is why he eventually discounted quantum mechanics altogether. If you don’t think being able to control a robot as if it were a part of your own body, far, far away on a distant planet is all that impressive, just think of the movie “Surrogates” starring Bruce Willis. Now do you get the picture? This ain’t science fiction no more, it’s science fact. Actually, I’ve been telling friends for years that robots are walking among us, both mechanical as well as biologically based. Do you really think they tell us everything? Downloadable on Amazon. Click on the image to go there. You can either buy from Amazon or download from Netflix, if they have it. Now for the truly sad stuff. Technology is a double edged sword, everyone knows that. Whenever you hear of some great technological advance, you know at some point evil people will use it. In reality, not to get to woo woo, man has been given technological knowledge by evil Angels (Fallen Angels) that has persisted to this day. Because that knowledge was given to humans who were willing to receive it, those people were necessarily evil. I mean come on, only evil people consort with evil Angels. Genesis 6 and the Book Of Enoch. This means that the bad people are way, way ahead of us and that your only hope is to stay close to God. You can’t compete against their technology (much of it spiritually based) on your own, the Exodus of the Jews being a perfect example. As these are the End Days and we are in the midst of “The Quickening”, obedience has never been more important. Beyond killer robot assassins and self aware computers, the most probable application of quantum entanglement by the evil people will be in the areas of signal intelligence and teleportation. Signal Intelligence because the spooks of the world (spies) are always looking for better ways to communicate. If you have a transmitter and receiver that are unencumbered by the constraints of distance nor physical location, you’ve got a radio that can give you near supernatural abilities. Just think of knowing everything at the moment it happens, anywhere inside, on or above the earth. Almost godlike omniscience. Did I mention that a quantum entanglement based radio would transmit through any thickness of lead, be free from interference from solar flares or any other electromagnetic event? You could be at the center of the earth or at the edge of the galaxy and still have instantaneous, crystal clear reception. This brings up something else that is very interesting, time travel of a sort. Back to Einstein’s Theory Of Relativity. Were you to send an Astronaut out into space at the speed of light, time would speed up for you and practically stop for him, relatively speaking. While he or she is traveling further away from you, time is stopping for them by your perspective, you would grow old however, while they would stay young. Now throw in a radio using quantum entanglement. Communication with the astronaut would be instant yet, the passage of time would be vastly different for him or her compared to you. When you spoke to the astronaut, you would effectively be traveling back in time to speak to a person for whom time has practically stood still. When the astronaut responds to your transmission, he or she would effectively be traveling into the future, because time is moving so fast on your end in comparison. Don’t ask me if your voice would sound like a Chipmunk on the astronaut’s radio, or if the astronaut would sound slow motion, I have no clue about that one. According to the theory however, by the time you finished a conversation, you would be old and the astronaut would still be very young. The second consequence of this now proven theory is actually the very news story that alerted me to the proof, teleportation. What scientists have actually proven is that information is able to be “teleported” via quantum entanglement, not the actual transfer of matter through time and space. Although this is mildly interesting, what is truly fascinating is that quantum entanglement seems to validate the concept of a single unifying theory, that the whole of our universe is connected by and can be explained with one single, all encompassing law. How else can you explain the seeming lack of any connecting force between two particles that are so entangled? Scientists regard the single unifying law theory as the keys to unlocking every other physical law and gaining complete control of them. Complete and total control of our physical world and everything observable in it, including the manipulation of time. They even believe that were that one law uncovered, the conversion of energy into matter and back again, would be possible. Could this be what the Anti-Christ will do, when he gives the world a period of prosperity that has as yet been unknown? Hmmmm. Count me out, I’d rather be a pauper Heaven bound, than wealthy and damned. Now that I think about it, just what exactly are they doing with that Hadron Collider anyway? The real reason that proving quantum entanglement is so immediately important is that it eliminates four monumental bottlenecks in super-computing, all at once. In theory, a quantum computer that uses entangled particles as switches instead of transistors, doesn’t need electricity at all. Entangled particles will exhibit their behavior in the absence of any external power source, they don’t need electricity. The crux of all this is being able to measure the change in position of each half of the particle, not an easy task because of their size and properties. Being able to measure this change of state is what enables the two halves to be used as switches and signals in a “quantum gate“. Of course, holding the particles in place would probably require some sort of external power source, magnetic field isolation and all (you can’t grab hold of an atom, what size tweezer would you use?). The bottleneck for electrical transistor based supercomputers today is that when electricity moves across a surface, it produces resistance or “friction”, just like any other physical thing. Electricity (current over wire) itself is actually just physical particles moving very fast in an organized way. You could actually say “electricity” has mass. Anyway,this friction produces both heat and amperage (the measurement of how much electricity is actually flowing). This is why super-computers of today have to be cooled to sub-zero temperatures. Most of you guys know all of this stuff already though, my simplistic explanations are just to make the point. I’m no scientist. Electricity or more accurately, the flow of electrical current, has a finite speed which can be measured just like the speed of light (photons). Well, everybody knows how important speed is to computing and when you are working with something that has finite properties such as electricity, you are going to hit it’s particular speed bump limitation sooner or later. Not only that, you can only make wires (circuits) so small before the heat of electrical resistance will melt them. Finally, the last problem with electrical current is that it has both attractive and repulsive properties, just like lightening. Lightening is attracted to an opposite charge and is part of the reason why a conductive metal rod stuck into the ground will attract it, path of least resistance being primary. Lightening usually has a negative charge (90% of the time) and the earth a positive during a storm (negative normally). The very same thing is true for electricity running through a circuit, wires that are that close together, flowing both positive and negative, are bound to attract each other and get crossed (signal bleed, signal degradation, cross fire). The electricity will “jump” and there goes your calculation. With “Spooky At A Distance” quantum computing, you do away with all of these limitations or, “bottlenecks” to performance. Scientists will tell you that interference is still a big factor, requiring shielding nonetheless, but I think they’ve solved that too. It’s funny how an announcement about Star Trek like acoustic “Tractor Beams” has just recently been reported. This could provide the very isolation needed that makes shielding of the particles feasible. Weird how all of these complimentary and mutually dependent discoveries for certain technologies are all coming out at the same time. Are we being groomed and prepared for “Full Disclosure“? Say hello to “HAL” walking around among us. The robots among us now. At this point and, since we’re on the subject, I feel the need to avail myself of the opportunity and warn you of helping further the evil, anti-human robot agenda. Artificial Intelligence already exists, the “Singularity” has already happened, as much as that will ever be possible anyways. Sentient supercomputers running AI software are already being beta tested right now, they have been for a long time. It has been said that the definitive proof that a computer has become intelligent would be when it could talk to a person (human being) without the human knowing he or she was interacting with a machine. Whenever you get one of those telemarketing calls, you could be talking to a machine that is so good at mimicking human thought and behavior, you wouldn’t have any clue it was a machine. You could flirt with it and it would flirt back. Talk about current events and get insightful responses. Express emotions and be appropriately responded to, all without ever knowing that no human was involved. Meet “Samantha West”, a robotic artificial intelligence who sells insurance. How do you teach a robot to be human? The problem for computer scientists in the field of artificial intelligence has always been describing our world to a computer. We as humans have physical bodies that can go out and interact with the world to learn, but a computer can’t do that. About fifteen years ago there was talk of constructing a specialized library of hypertext markup language that a computer could use to learn about our world from the internet. IBM’s “Watson” program has negated the need for any such specialized accommodation. If you think about it, there has never before been a so readily accessible compilation of knowledge describing the world than the internet. The internet is both historic and dynamic, continuously changing and being developed by those who use it. What better store of knowledge, facts, patterns of behavior etc. than the Web for which to “teach” a machine all about both ourselves and our environment. A store of all human knowledge so readily digestible and custom made for a machine that one better could not have been imagined. 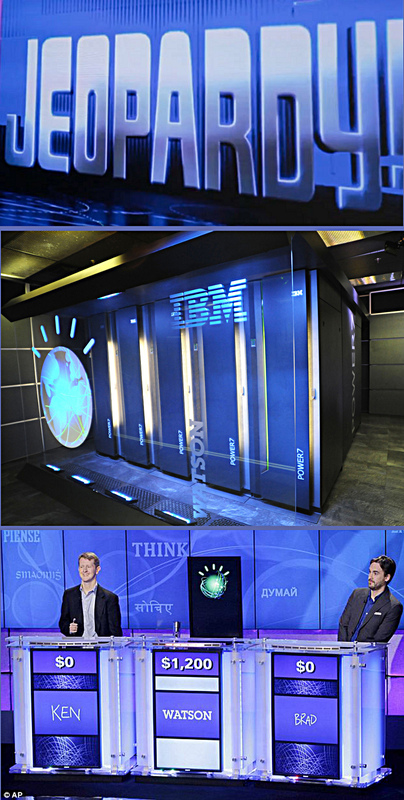 IBM’s super-computer Watson uses the internet to outperform human intellect. They will tell you that it’s abilities are very narrow in scope and confined to purely analytic endeavors. If you’ve been paying attention to the theme of this post then you have probably put all the pieces together. They’ve developed the mind and now they have the body. 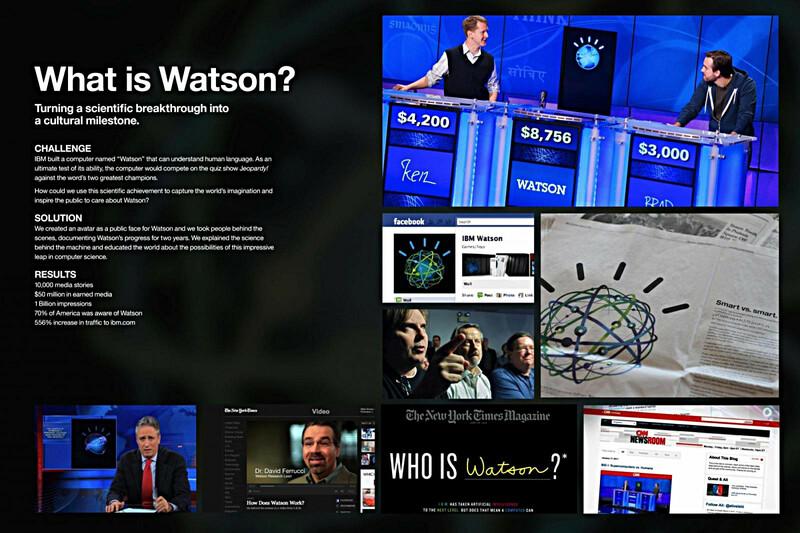 IBM’s “Watson” beating mere humans on Alex Trebeck’s Jeopardy. Meet the super-computer Watson, who learns from the internet. A cute and gentle way of introducing your future “Master” and replacement. They’ve developed the mind and now, they have the body.